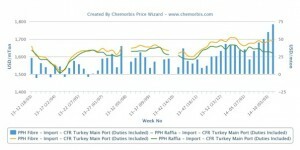 PP fibre traditionally carries a small premium over raffia in Turkey as per the pricing service of ChemOrbis. 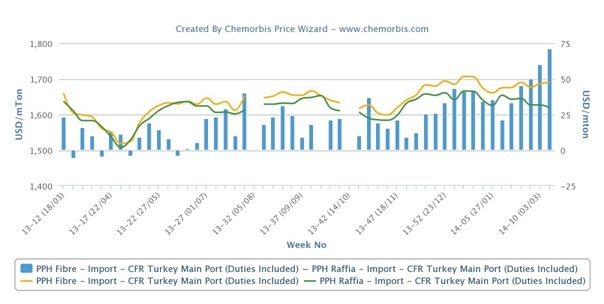 However, this premium has grown to be more than $70/ton based on the average ChemOrbis Price Index, hitting a year high as can be seen from the graph below. PP fibre buyers, most of whom are located in the southern part of the country, have seen mostly stable prices from their regular suppliers, although lower levels or competitive prices have been obtainable in the raffia market recently. This caused the traditional gap between the two products to widen gradually. There are several reasons behind this growing premium. First and foremost, demand for fibre has been relatively better than for raffia since the beginning of the year. As most of the fibre converters are export-oriented, they have been hit less by the fluctuating local currency and faltering domestic demand. Accordingly, steady buying interest has been seen for fibre grade. Secondly, fibre buyers rely heavily on the Middle East, where regional suppliers continue to claim having limited availability. There is less competition in the fibre market due to the relatively fewer numbers of supply sources when compared to the raffia market. Competitive offers have shown up for raffia from Romania, West Europe and Turkmenistan recently while Indian and Russian origins also offer a variety of choices. Indeed, some competitive offers have also been reported in the raffia market from the Middle East this week at $1530/ton CIF and $1550/ton FCA, which are balanced with the netback to China. When it comes to the fibre market, current offers from the region are at least $50/ton above these raffia offers despite a traditionally smaller premium between the two grades. Another reason why Turkey’s import fibre market carries a larger premium over raffia is that Iranian supply is expected to diminish ahead of the holidays in that country. Regional offers have edged higher accordingly in the past few weeks. This has come on top of the claims about already limited availability for Middle Eastern origins.